September is Roald Dahl month and September 13th is Roald Dahl Day in honor of his birthday – he was born in Wales in 1916. For that reason, I have chosen to look at one of his autobiographical books, Going Solo, for Non-Fiction Monday. 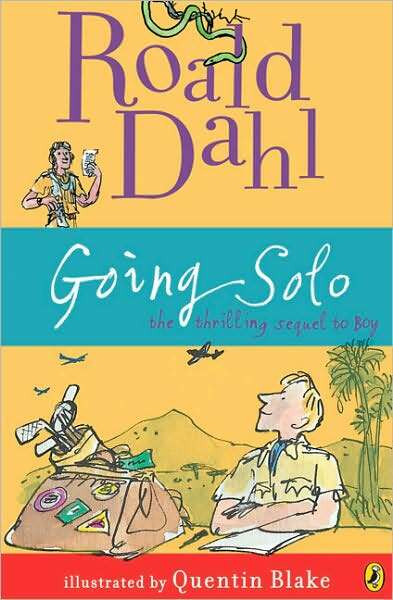 Going Solo begins with Dahl traveling to East Africa to work for the Shell Oil Company in 1938 at the age of 22. It took two weeks to travel from London to Mombasa by boat and Dahl provides vivid, humorous descriptions of some of his fellow travelers, which he characterizes as “that peculiar Empire-building breed of Englishman who spends his whole life working in distant corners of British territory,” And they are a set of characters, for instance, the elderly Major and his wife who exercise every morning by running around the ship’s deck – stark naked. Or his roommate who sprinkles Epsom Salt on his shoulders everyday to look like he has dandruff in order to hide the fact that he wears a wig. Dahl was stationed at a place called Dar es Salaam, Tanzania, then called Tanganyika. He lived there with two other young Shell employees and their servants, but was also required to travel to Shell outposts, often for a month at a time. Dahl doesn’t go into any detail about his job, but he does about the people, the land and especially the animals he encountered. Dahl also provides amazing anecdotes about encounters with a lion and the dreaded killer mamba snakes he was so afraid of. As soon as war was declared against Germany, Dahl was ordered to leave his job and became a temporary Army officer. His first order was to round up all the German civilians, mostly shopkeepers, in the area and put them in an internment camp, even though they had been doing friendly business with them all along. There was one ugly incident doing this, but in the end the task is accomplished, although the German women and children were allowed to return to their homes instead of the camp. 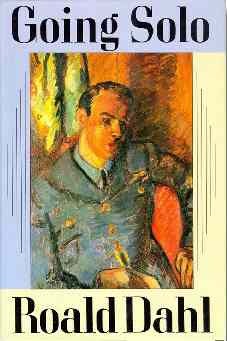 In November 1939, Dahl decided to join the Royal Air Force, traveling alone for 600 miles to enlist in Nairobi. Flight training went well and Dahl was assigned to the 80 Squadron in the Western Desert. Flying solo to reach them, he could not find a landing airstrip to refuel before nightfall and was forced to land his plane in the desert, where it hit a boulder and burst in flame. Dahl survived, but spent months in hospital recovering from his injuries. Once he was sufficiently recovered, he was sent to Greece where the 80 Squadron had relocated and discovered they were expected to defend against a very well equipped enemy, the Germans and the Vichy French, with only 15 one man Hurricane planes of their own. Given his descriptions of the air battles with Germans, it is amazing anyone survived, and actually, not many did including Dahl's good friend, David Coke. Dahl seems to have had great good luck all through his RAF days. He was transferred to Palestine after Greece was captured by the Germans in April 1941. One of the oddest stories he tells was of finding a group of German Jews, about 50 children and two adults in the middle of a secret landing strip in Haifa, who had actually helped to build the landing strip. Altogether, Dahl flew sorties from April 1941 to June 1941 often as many as five times a day. He was invalided out of the RAF and sent back to England when he began to experience terrible headaches that caused him to blackout while flying. These headaches were the result of his old crash injuries. I found Going Solo to be an oddly engaging book, pulled in from the start by Dahl’s wonderful descriptions of what was going on around him, first on the ship and then in Dar es Salaam and later in Kenya. Of course, the book was written in 1986, so one must always keep in mind that Dahl’s memories had forty years to marinate. Generally, I space out when I am confronted with detailed descriptions of military things because I don’t really understand that kind of stuff. However, I found Dahl’s explanations to be quite interesting and understandable without sounding condescending. Dahl loved photography and many of the black and white photos he took from this time in his life are interspersed throughout the book, as well as maps and bits of letters and telegrams. Dahl originally wrote about his RAF experiences in a 1946 book called Over to You: Ten Stories of Flyers and Flying, which is also still available, but the stories are definitely not meant for young readers. This is the original book I found in the Hunter College Library and read. There is a new reissue of it available now as shown. Thank you, Alex, for posting on NONFICTION MONDAY today...I was a little worried no one was going to post a Roald Dahl and failed to pick up one myself to review. 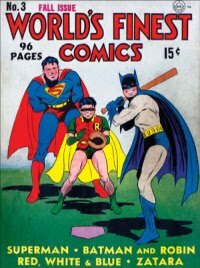 Thank you for making sure we had a title by him on HIS day! Glad to be of help and thanks again for hosting Non-Fiction Monday this week. I really want to read this book now. It looks like we have similar paths, going abroad at 22, though I don't expect to be in any plane crashes or fighting any wars (I hope not, anyway). I also space out when it comes to military stuff, but Dahl's style is always engaging, so based on that and this review I think I would give the book a shot. Thank you very much! Im Dutch and I can use this summary for my book test for English tomorrow. I already have read the book so its a great supplement.